NOW that the high season has drawn to a close, and trips are less frequent, I spend the majority of my time in my field, eating! When the haynets are finished, being an animal of very little brain and, dictated by my stomach, I tend to go in search of food. Winnie the Pooh sought out honey, but I’m partial to apples. One of my latest escapades involved scrabbling under a barbed-wire fence, negotiating a miniature railway line and a campsite! Luckily, I only left a few grey hairs on the fence, there were no trains coming and the campsite was empty. As it was 6am and pitch dark, I thought I’d see if the cafe was open. The tea rooms at Canal Central in Maesbury don’t open until 10am, so I went for a little wander around. This involved reconnoitring the building, via the car park, and finding the wheelchair ramp up on to the wooden decking that encircles it. Clip-clop must have sounded a little loud on the reverberating planks, because the lights went on upstairs and some puzzled and concerned faces appeared at the windows. These belonged to the B&B guests enjoying a peaceful and relaxing break in the solitude of the Shropshire countryside. I beat a hasty retreat! Once my attempts at freedom are rumbled, I usually give up without a struggle. This is mainly because I don’t want to outstay my welcome, and have to find fresh accommodation. Although I’m supposed to be a herd animal, I much prefer my own company (the more food for me! ), and have been asked to leave previous homes because I’m a bit of a bully! Moi? Inconceivable! By mid-morning my Houdini act had been broadcast far and wide, and one of my team arrived to reinforce the meagre single strand fence. This involved purchasing some hefty looking staples, more wire fencing and some protective gloves. It should have also included some earplugs because unravelling barbed wire is apparently not an easy task, gloves are never thick enough and best jumpers should not be worn when doing it! I endeavoured to help by standing very close (I like human company), and whinnying with understanding when misdirected hammers missed uncooperative staples. My commiserations only led to another stream of Anglo-Saxon vernacular and the questioning of whether my parents were ever actually married, and wouldn’t I like to “go forth & multiply”?, something us geldings struggle to do. On completion, my paddock looks like the formidable structure that Steve McQueen faced in the film The Great Escape, all I need now is a motor bike! Things to do at Christmas when you don’t like Xmas! 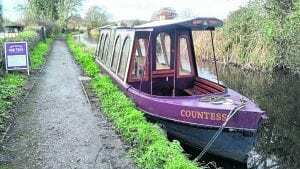 As we are now open all year round and especially during this festive season, if you yearn for a tinsel-free zone, devoid of all Christmas commercialisation, with a distinct absence of naff, seasonal music, then why not try one of our horse-drawn canal trips? It’s a truly unique experience. We don’t distribute free humbugs on board, but I’m sure you get the picture. We’re actually getting some nice enquiries from local firms wanting to do something a little bit different from the usual ‘works do’. We’re marketing these trips as a ‘canal experience’, which includes, along with our usual historical (or should that be hysterical?) commentary, practical demonstrations and involvement with lock negotiation, boat steering and horse management! These excursions are proving to be very popular with companies wanting an alternative to the usual turkey, pudding and hangover, so if you fancy doing something out of the ordinary, why not give us a call? 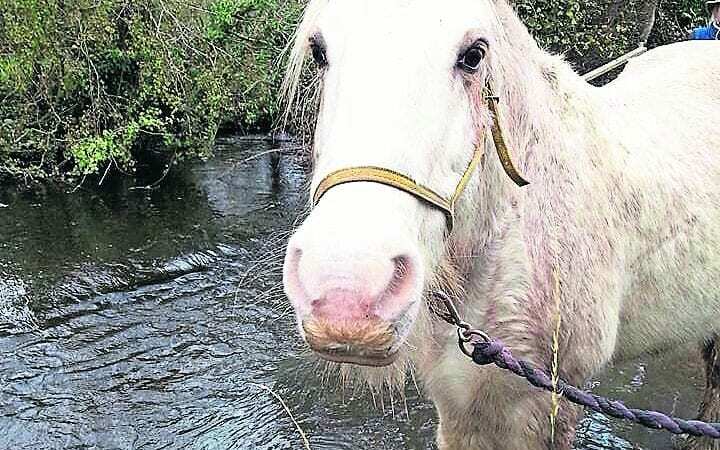 We may not be able to offer you a religious experience, but we can promise peace, tranquillity and goodwill to all men, women, children, dogs and horses! 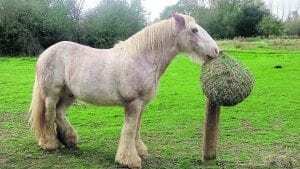 Finally, you may be wondering how, as a light-coloured horse (please note that I’m a strawberry roan, not a grey), I’m always immaculately turned out. Well, apart from a lot of elbow grease and grooming, my team take me down to the Morda brook for a good paddle, prior to a trip. As you can see from the photo, I love my little dips! On a final note, our prices are going to go up next year, though if you book before Christmas we can honour our current pricing for groups, even if your trip isn’t until next year. Previous Post:A site for Soar eyes! 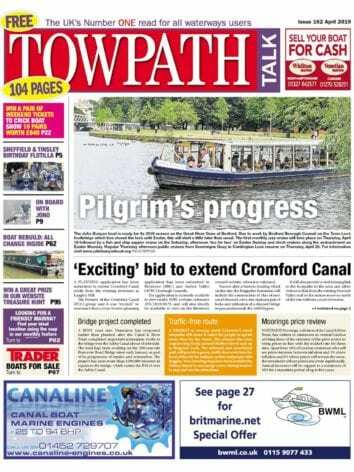 Next Post:Towpath Talk – February issue now available via the app!